I love working with my favourite colours! For this swap, make any ATC you like using the colours in the title above. You can use small amounts of neutrals (black, Kraft, skin tones, ivory, tan, dark brown) but no other colours (a super tiny bit is ok). The next two swaps will be inspired by winter. One will be a traditional winter combo and the other will be non-traditional. Today we will do the traditional one. 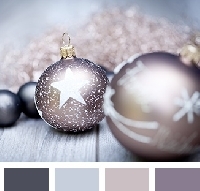 Silver, white, pale blue and pale purple. However, the theme does NOT have to be winter unless you want it to be. *no teacher/reward stickers, pixelated computer printouts or magazine pages (unless significantly and beautifully altered). *make something lovely you'd be proud to receive and wish you could keep for yourself! *this is sender's choice but please respect your partner's dislikes for instance, don't add bugs if they hate them or themes they don't like. *please have no recents 3s or any 1s without a good explanation in the comments of that swap or send me a note first. *Please consider hearts for your partner if they made a really nice Card. Extras are not the only reason to give hearts. *i will angel once you have PMd twice and gotten no or negative responses and have rated a 1. Let me know if things aren't working out in your discussions. I'm happy to help!